Stantonbury Campus Theatre Company (see here) presented two plays in repertory, in November 2000, at Stantonbury Campus Theatre, Milton Keynes, Bucks. The shows may be over – but the website lingers on! 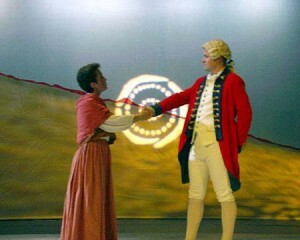 Much of the material on this website was prepared for, and published in, the programme for the productions. These were amateur productions aiming at professional standards of preparation, presentation and performance. Captain Plume, weary from the triumphant battle of Blenheim, returns to Shrewsbury to recruit men for his regiment and women for his bed. But the recently enriched Silvia Balance wants him for herself alone, and mixes up the two forms of recruiting in a plot bordering on the farcical. A range of comic characters from Justice Balance to Costar Pearmain portrays – with gentle satire – the huge differences in wealth and social standing in an 18th century town: and Farquhar portrays the very human weaknesses of military “heroes”. 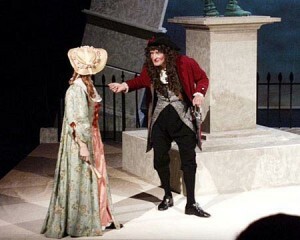 “The Recruiting Officer” was an immediate hit when it opened at Drury Lane in 1706: it became the most frequently performed play of the 18th century. This production aims to be fun for all concerned. Based on an historical incident and on Thomas Kenneally’s novel “The Playmaker”, Timberlake Wertenbaker’s inspirational play, shows us the redemptive, transcendental power of theatre with great elegance and passion. Now recognised as a modern classic, and an A-level set text, it was first performed at the Royal Court Theatre, London in 1988, winning the Laurence Olivier Award that year.